Twin/Twin Modera Natural Finish Bunkbed Is Solid Pine Traditional Style. Available In Honey Natural Finish (Shown), And In Cherry Finish. Safty And Sturdy Metal To Metal Joints. 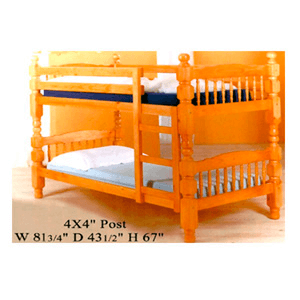 Comfortable And Safety Ladder Can Be Installed On Either Side Of The Bunk Bed. Includes 2 H/Boards, 2 F/Boards, 4 Slat Rolls For Mattress Support, 4 Rails, 2 Guard Rails, Ladder,4 Post. Easy To Convert Into Two Separate Twin Size Beds. Dimensions : 81L x 43W x 70H.Also Sold Separately 5 Drawer Chest Model# 9505(MD)or 6 Drawer Chest Model# 9506(MD),2Drawer Night Stand #9502(MD).Mix And Match To Make A Complet Bedroom. Mattress Features: Twin: 216 Coil Spring Units. Wall Units. Modern Style. Strong Construction. Wall Units In Silver And Beechwood Finish, 3-Tier Wall Unit 5663-SLV (ML) and 5-Tier Wall Unit 5665-SLV (ML). Also Available In Gun Metal And Maple Finish (View Larger Picture) 3-Tier Wall Unit 5663-GMT (ML) and 5-Tier Wall Unit 5665-GMT (ML). Easy to assemble.Size: 3-Tier 15 x 33 x 49 inches. 5-Tier 15 x 33 x 64 inches. Futon Cover. Available In Full, Queen, And Twin Size. Comes In Color Black, Navy Blue, Burgundy, Hunter Green, Cobalt, Red, Blue Bonnet, Khaki, Natural, Pink, Charcoal, Orange, Purple, Olive Green, Teal, Lavender, Yellow, Mauve, Sage, Royal Blue, Sand, Sky Blue and Brown. High Quality. Strong And Durable.Normally Ships in 1-2 Business Days. Discount Available For Product and Shipping For Large Orders. Office Chair. Durable And Comfortable. Dimensions: 17/22 x 16 x 15..